Best Phablets which covers the gap between Smartphone and Tablets.Sony Xperia T2 Ultra is the small and sleeker with Dual SIM`s options More Important about this smart device this six-inch budget phablet faces the mammoth task of proving itself against the competition in a fairly crowded price band. 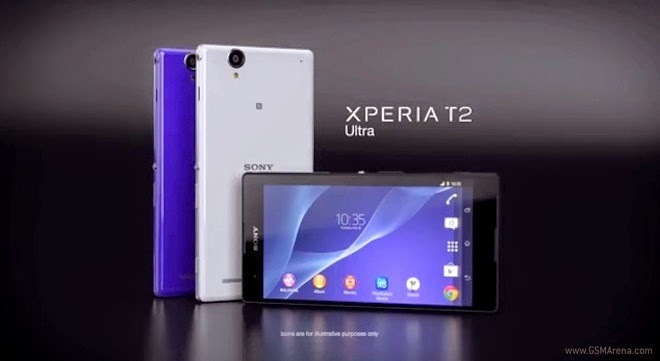 This Phablets has everything like Smart Camera, Brilliant Screen, Entertainment in very reasonable price Sony Xperia T2 Ultra is available in three colours: black, white and purple. On Back side you can find really long speaker grille, rear camera and flash.It has energy efficient processor and a large 3,000 mAh battery with STAMINA mode, 13 Mega-Pixel Camera. Android OS, version 4.3 - Jelly Bean, Quad-core 1.4 GHz, Qualcomm, 8 GB built-in ROM, 1 GB RAM, microSD Card - supports up to 32 GB, 6.0 inches Big Screen with 720 x 1280 pixels, 16 Millions Colors, TFT capacitive touchscreen, Triluminos display, Mobile BRAVIA engine 2 Multi-touch (up to 10 fingers). 13 Mega-Pixel, 4128 x 3096 pixels, auto-focus, LED Flash, Geo-tagging, touch focus, face and smile detection, image stabilization, HDR, 3D sweep panorama, Video up-to 1080 pixel @ 30 fps, with video stabilization, HDR, On Front Side 1.1 Mega-Pixel 720 pixel @ 30 fps. Stereo FM radio with RDS, Games - built-in + downloadable, Bluetooth, USB, WLAN (Wi-Fi 802.11 a/b/g/n, dual-band, Wi-Fi Direct, DLNA, Wi-Fi hotspot), GPRS, EDGE, 3G, GPS + A-GPS, support, GLONASS.